A five day regatta can be tough, and after the long 4-hour-plus coastal race yesterday, there were some tired sailors on the beach this morning for the final day showdown. Breeze to the South of Chaweng was blowing a healthy eight to 10 knots as Race Officer Ross Chisholm readied the fleet for two windward/ leewards to close out the series. Coming into the last day, the winners in three of the four classes were already known, however, in IRC Zero, today’s racing was to decide second and third while in IRC One, nothing was set in stone as one mistake in what has been incredibly close racing all week, could make the difference. Samui Regatta’s had it all over the years. Countbacks, two-second series deciders and today, races tied on corrected time in two classes – THA72 tied with Zannekin in IRC Zero (Race 1), and Loco tied with Ramrod in IRC One (Race 1). The IRC experts have been very busy! 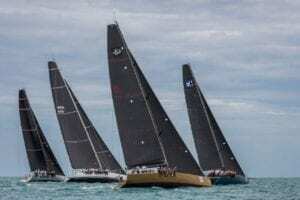 With the TP52 of Kevin and Tom Whitcraft having already won the IRC Zero title yesterday, all eyes were on the battle for second and third between Zannekin (HKG) and Freefire (HKG), and Zannekin were carrying a points advantage into the final day. As has been the case all week, THA72 pulled away at the start and chased Jelik around the course to cross the line just three minutes adrift. It was enough for the win on corrected time, and the smaller 46-foot Zannekin recorded the exact same time on handicap. Both were scored 1.5 points each, allowing Zannekin to increase their lead over Freefire in the series. The close racing continued in the final race with less than a minute separating the top three, and this time is was an outright win for THA72 with Zannekin getting the better of Freefire by just eight seconds to finish second and third respectively. Apart from Race 8 when Zannekin sailed the light airs best, THA72 has been untouchable, finishing the series with eight wins, one tied first and a third. A pretty impressive scorecard with which to defend their Samui Regatta title. The scores have been checked and re-checked for IRC One and it’s correct: David Dimmock’s Loco and the Ketelby/Sorenson/Brown/Douglas Ramrod tied for first in the first race of the day. While they shared the honours, the all-Chinese crew on Ocean Knight sailed an impressive race to finish a mere eight seconds back in third. Anthony Root’s Black Baza, who’s managed to finish in almost every position this week, finished on a high note with a win in the final race. And it was hard earned, just five seconds ahead of Nick Burns/Fred Kinmonth’s Mandrake III who’s second place, together with a sixth for Fujin, was enough for them to finish second overall ahead of Fujin in third. A third place for Ramrod in the final race saw them improve their overall standing in fifth, while the glory this week goes to Loco. No doubt a fifth place wasn’t the series ending they had hoped for, it made no difference as David Dimmock and crew claimed the class trophy with an impressive scorecard of consistency. Bringing an end to Lady Bubbly’s Cruising class winning streak yesterday, Tim McMahon’s SailQuest Hi Jinks continued in their new found groove winning the first exchange today by almost two minutes on corrected time. 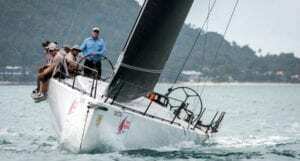 It was a similar story in the Multihull class with Mick Tilden’s Pixalux adding their second series bullet, beating Nut Thongtoam’s Multihull Solutions H3O in the first race. Situation normal returned in the final race, however, with Lady Bubbly capping off their series victory with a win and Multihull Solutions H3O adding one more win their top-of-the-standings tally. Samui Regatta brings to a close the 2016/17 AsianYachting Grand Prix season and after 12 events throughout Asia, Anthony Root and Steve Manning’s Black Baza reigns supreme, and for the second consecutive year were confirmed as the Skipper(s) and Yacht of the Year.